Here in the latest instalment in our continuing series on great feats of engineering, we take a look at the stunning and quite remarkable Millau Viaduct, which is considered by many to be one of the greatest engineering achievements of all time. The Millau Viaduct, located in southern France, is the tallest bridge in the world, and at over 342 meters at its highest point is even taller than the French icon the Eiffel Tower. This spectacular feat of engineering traverses the River Tarn, in the Massif Central Mountains and was built in an attempt to relieve congestion along the route from Paris to Spain. Plans for a bridge in this region were first discussed back in 1987, however it was not until a few years later in 1991 that the decision was made to build a bridge that would cross high above the River Tarn. Several plans and proposal were put forward for the project however, in the end, the winning design was the brain child of the French engineer Michel Virlogeux and English architect Lord Norman Foster. Construction on the project began in October 2001 when the bridge’s foundations were set into the bedrock. A number of new engineering techniques had to be employed in the construction of the bridge, given the significant challenges presented by the sheer scale of the project. For example, whilst cable stay bridges are traditionally constructed by building sections of the bridge deck first and then hosting these into positions using cranes, given the height of the bridge the development of a new technique was required. In the end the engineers working on the project decided to try out a new method, whereby the bridge deck was built on either side of the valley and then rolled into position, before meeting in the middle. Despite having never been attempted before, this rolling out operation proved to be a huge success. Construction on the project proceeded remarkably swiftly. In total the bridge took only three years to build and was even completed a month ahead of schedule. The bridge was finally opened in 2004 and at 1,205 feet tall and 8,071 feet long is a stunning feat of design and engineering. The bridge is remarkably beautiful to look at, too, and on cloudy days appears to almost float among the clouds in the sky. 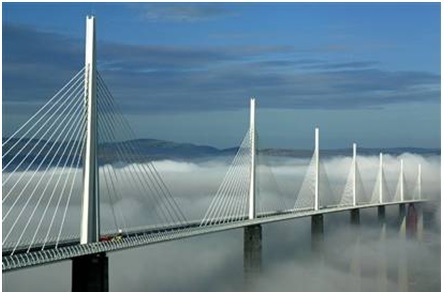 The Millau Viaduct is a fine example of engineering at its best. Here at European Springs we’re passionate about engineering on all scales and are suppliers of a fantastic range of high quality spring products, including disc springs , to the engineering industry. For more information about our range of products and services please don’t hesitate to contact us today by giving us a call on +44 (0) 208 663 1800, and a member of our friendly team will be happy to help you with your enquiries.